BetVictor were founded in 1946 and are one of United Kingdom's oldest bookmakers. Thanks to their commitment to new technology they now have mobile sportsbook customers in over 16o different countries. 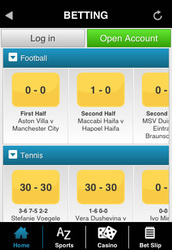 We no longer recommend the BetVictor app due to its lack of features and poor design. If you're looking for a quality mobile bookmaker with free sports streaming, unbeatable odds and great promotions, Bet365.com is currently your best option. Available on iPhone, iPad, iPod, Android, Blackberry & all other devices. £25 free bet for all new customers. BetVctor will match your first bet up to £25. 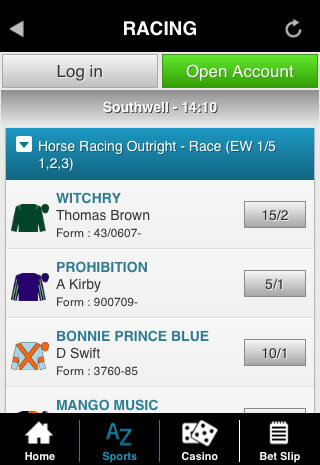 Watch every horse race from the UK & Ireland on your phone or tablet. Mobile customers get exclusive betting offers not available anywhere else. 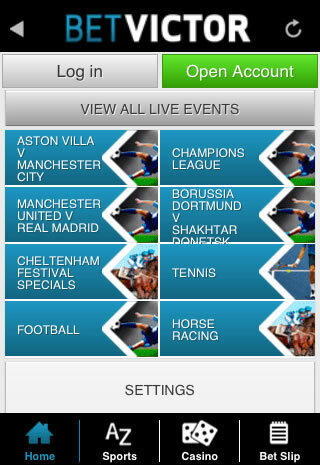 Bet on every market & event from the main website from your phone or tablet. Serving hundreds of thousands of clients yearly through its extensive network of high street bookmakers, William Hill has long been one of the UK’s largest and most traditional betting establishments with over 70 years’ bookmaking experience. Moving with the times, however, the company now boasts an online gambling presence offering extensive sports betting options and has further moved into the mobile and tablet market. With almost a quarter of its online customers now placing bets on the move, punting from the pub or the terraces via mobile has taken off in a big way. It allows clients to bet anytime, anywhere on any sporting event available to customers online via Williamhill.com. Options include in-play betting, accumulators and ‘hot picks’, essentially round ups of the most popular bets being laid on particular events. Extensive live betting is offered to Betvictor customers on a full range of sporting events. Impressively, Betvictor offers live coverage of all UK and Ireland horse racing right to your handset with live streaming from ATR and RUK. A touch of a button provides customers with a full range of betting options in the extensive casino available on the app. Roulette and blackjack are popular, along with a plethora of gaming options for those looking to whittle away the hours punting with a bit of fun attached. A special ‘spincast’ feature is available to premier league football fans. Customers select the premier league game of their choice and bet on the 90 minute result, over/under total goals and anytime goal scorer in a particular match. Odds for the selected game are then displayed as wheels which can be moved up or down according to the desired bet in order to view and compare odds and find a combination of your choice. A randomising feature also allows you to go for a pot luck outcome (not a bad option when your more considered bets are not exactly going according to plan). The Spincast feature is available as a separate downloadable app. Although perhaps a touch gimmicky, for those concentrating on football bets, and the premier league specifically, it is an enjoyable feature. The Betvictor app has a classy but simple look and is well laid out, avoiding the pitfall of having too many tabs and highlighted bets greeting the customer. Buttons are kept to a minimum and this helps to give the app a user-friendly feel. A special featured bet of the week heads the top of the screen and a single live bet is advertised above a tab for all live events. Underneath this, the main body of the screen displays tabs for accessing betting options on six major sports, with a single tab below for all the rest. Sports and casino special offers appear on large buttons lower down the page, along with quick access to a ‘settings’ tab in order to manage the app (it is available internationally in a multitude of languages)and quick access to the ‘spin cast’ feature. Logging in to your account is easily done via a large central button at the top of the screen. A very nice touch is the presence of quick access buttons at the very bottom giving the impression of being separate to the app and integrated with your mobile handset. These provide instant access to the full list of sports available for betting, direct access to the casino and, helpfully, your betting slip. A home button further aids navigation. Within individual sports tabs, matches and races are well organised, making it easy to head straight to specific events. All in all navigation is logical and easy and aided by the lack of confusion and clutter on the app; less really is more in this instance. Currently, Betvictor promises to match the value of your first bet up to a maximum of £25 for all new customers opening an account. 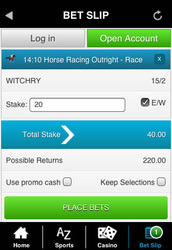 The first bet must be placed within 30 days of account opening. 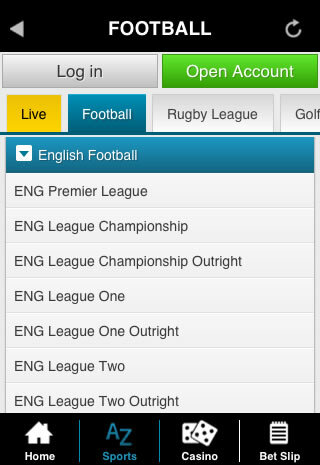 Betvictor offers the full range of betting options and markets via the app as are available via the online web site. 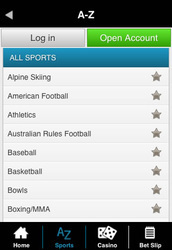 All sports are covered from around the globe with an extensive array of in-play bets available. Horse racing punters are particularly well-catered for with the whole gamut of race betting available, including live events and an envious amount of betting options available on races outside the UK and Ireland for those with a more global approach to the horses. As stated, live streaming of horse racing is available for all races within the UK and Ireland. Punters on football and horse racing are, not surprisingly, the mainstay of any bookmakers and accordingly are well looked after by Betvictor. Those betting on the football markets can rest assured that they are in good hands; Betvictor boasts that, according to online betting comparison site Oddschecker, based on analysis of data from the 2010/11 Premier League season, Betvictor came top when compared with other bookmakers for offering both the best average prices and the best price most often throughout the course of the season. Furthermore, Betvictor was found to have offered the best prices on the ‘Big Four’ of Man United, Chelsea, Man City and Arsenal. Aside from boasting solid credentials when it comes to football betting, Betvictor offers a variety of football bet bonuses and offers, both on general markets and individual matches that change weekly. For example, Betvictor currently offers a ‘Both teams to score’ money back guarantee for those placing a both teams to score bet 5-fold or more on the weekend’s matches. Losing bets will be compensated with a free bet up to £10 to use on a both teams to score 5-fold the following weekend. By varying its offers and money back guarantees, Betvictor creates interest in a variety of different markets and individual matches and livens up those games that may not otherwise tickle the fancy. For racing fans, Betvictor also provides a ‘Best Odds Guarantee’. Punters taking an early price or board price who find that the starting price if greater will be paid at the bigger price if they win. This offer is only available to bets placed via the internet and mobile handset and only applies to UK and Ireland races and does not apply to live in-play betting. Other free bet offers and guarantees are made available on specific race meets, such as the Grand National and Cheltenham. For example, the current offer for this year’s Aintree National is a non-runner free bet. Bets placed on the 2013 Antepost market where the selected horse turns out to be a non-runner will be refunded in the form of a free bet. Although arguably there are other apps providing more generous offers on the markets, Betvictor’s guaranteed best price and changing free bet offers make for both a solid and more unusual betting experience on the markets. 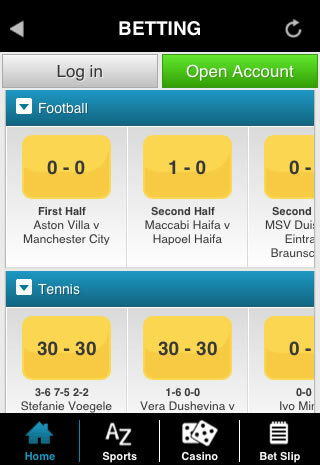 Help and support is given prominence on the Betvictor app via a large ‘Help’ button in the centre of the screen when scrolling down. A welter of information and advice is given via a ‘Frequently Asked Questions’ section, along with other betting rules, terms and conditions. Support is helpfully provided by a 24/7 customer service centre that can be contacted via email or phone. UK and Irish Freephone options are given. 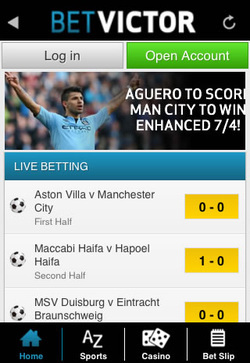 The Betvictor sports app looks good, is well-organised and provides a very user-friendly betting experience. Simplicity is key here and Betvictor does it well, as you might expect from a bookmakers whose significant success comes from its’ online markets. Live streaming direct to your mobile for horse racing events is a plus for race lovers and its’ competitiveness in football markets is a big draw too. 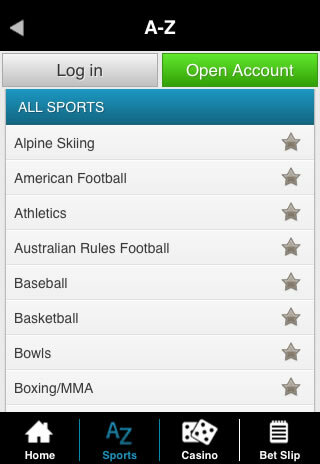 All in all, it has a really good feel which helps distinguish it from other mobile sports apps.